Episode 5 - I briefly give my opinion of the previous episode on Shakuntala and Dushanta, and then get going with the birth of mighty Bhisma and his two not-so-mighty brothers. This is an important episode, because in many ways, it is Bhisma's over-reaction to his father's desires that ultimately sets the whole tragedy in motion. I used to think that if you distill everything out of this story you get: all suffering is caused by love of parents for their children or children for their parents. Had Santanu not tried to couch his desire in terms of Vedic justification for many sons, and not tried to protect Bishma from losing the throne, we sould have a different history. Obviously, there's much more to it than that, but we do come up against errors for the sake of children and parents all the time. One more thing, isn't there another version of the story where the Gods are in a celestial audience and Ganga's dress blows open, everyone averting there eyes except one? Then they're all cursed to inhabit human form/mitigated for all but one? I suppose there's basically an infinite number of versions of all these stories. You probaby could distill your theory one step further to say that all the suffering is due to misbegotten love of various sorts-- not just parents & children, but also men & women and love of power. They say that the Mahabharata is a very (very very) subtle argument against Buddhism, and if so, you can certainly see the subtext of the 2nd Noble Truth-- "suffering is the result of desire". But of course, in this story, Krishna is the equivalent of the 8-fold path! You are right also about the incident with Ganga's skirt blowing up. I forget the guy's name, but he was doomed to be incarnated as Sanatanu; so we get a back-story to the relationship between Santanu & Ganga. Taken as literature, some people (including van Buitenen) object to this and the whole "partial incarnations" back-story. They feel like it makes everything pre-ordained and it drains out all the human drama from the story. I sort of like it myself, because it raises the whole question of free will-- we imagine that we are in control of our decisions, but how can we know that for sure? The various curses and incarnation back stories raise this question. I just left that vignette about Santanu & Ganga out because it seemed like an unnecessary detail. Hopefully, some listeners are getting the story for the first time, and I don't want to scare them off with too many digressions! There are enough of them already! That's one of the reasons I haven't read the van Buitenen (but I guess I'm really going to have to). There is definitely a tone of incredulity to it, somehow as if the translator is trying to justify the veracity of the epic. It gets under my skin since I'm just swept away by the story. 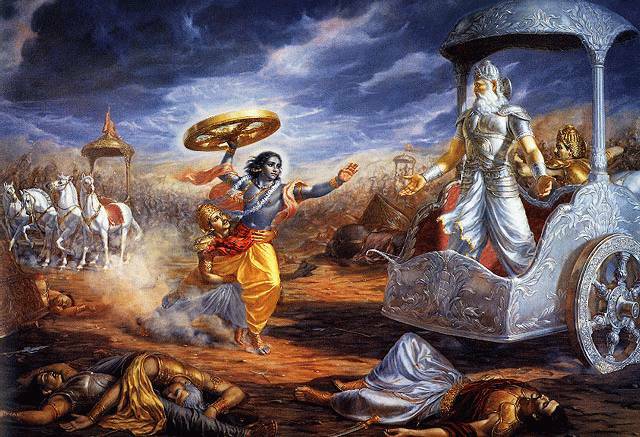 along with the fact that everyone was an incarnate and everyone, in the end died because of some or the other curse.. Mahabharata is also full of situations where a victim of slightest of injustice takes a solemn oath to destroy the perpetrator in most gruesome manner or puts a curse to that effect.. I read a short and very interesting commentary on Mahabharata, from a sociologist's perspective "Yugant - End of an Epoch" by Irawati Karve. That arose my curiosity and I wanted to read the complete text. I came across your podcast while i was looking for a copy of Mahabharata to read. After listening to first two episodes, now i think i'll first listen to all of the available casts before i start reading Ganguly's. Sorry, it is there, but out of order. Have a look up past episode 66. You'll see that 67, 5, and 68 are out of order, but all next to each other. I made an edit to this posting and that moved it out of order and now I don't know how to get it back where it belongs! Let me know if you still don't see it.